By Kali Hawlk 2 Comments - The content of this website often contains affiliate links and I may be compensated if you buy through those links (at no cost to you!). Learn more about how we make money. Last edited May 8, 2014 . Talking about personal finances with your friends and family can be a tough subject to broach. It’s a bit of a taboo, as we’re taught that discussing any aspect of our money with other people is rude. As difficult as it is to bring this topic up with your loved ones, it’s even more difficult to sit idly by and watch as someone we care about struggles with debt. Thankfully, as more and more people express a desire to take charge of their finances and make a positive change to their money management habits, it’s becoming easier to talk with close friends and family about debt. If someone you care about is struggling to stay financially afloat, you can speak up and extend an offer to help. 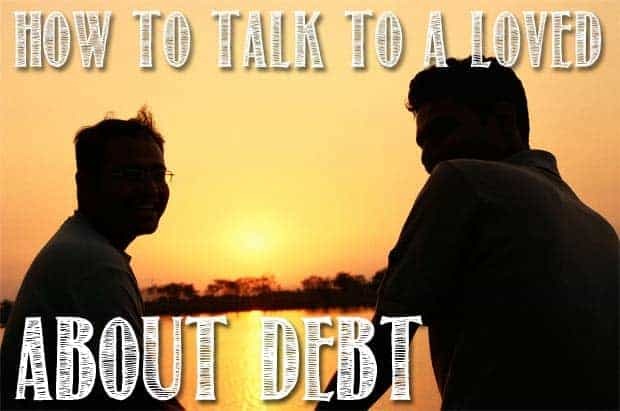 Here’s how to talk to your loved ones about debt. Let’s face it: there’s nothing good about debt. But that doesn’t mean your loved one has done absolutely everything wrong with their money. Before you even begin the conversation, plan to recognize what they’ve done correctly and focus on moving forward from that point in a positive way. If you can’t do anything but criticize what they’ve done wrong, your talk will go no where and you’ll likely cause your friend or family member to shut down and become defensive. When this happens, the conversation can’t be constructive or productive. Additionally, don’t enter any talks assuming you’ll be able to tell someone exactly what they should and should not do. In the end, it is their money and they have the final say in how it is used. You need to offer suggestions, not ultimatums or strict instructions on what actions to take. Sometimes, it’s not what you say that upsets people: it’s how – and when – you say it. Again, before you even sit down to talk with your loved one about debt, make a plan. Aim to hold your conversation at a time where your friend or family member won’t be overly stressed, anxious, or overly emotional. Also, be sure to speak when you’ll both have enough time to have a long talk if necessary and when it’s unlikely that you’ll be interrupted (in other words, speak privately). When you do open a dialogue, be sure to express your concern. Make it clear that you care deeply about the person you’re speaking with, and wanted to bring up this sensitive subject because you care about their financial well being. Once the conversation is rolling, be prepared to let your loved one speak freely. You may be doing a lot more listening than talking at first, especially if they’re just starting to accept that their debt is a problem that needs to be solved. When it is your turn to speak, make sure your words are non-aggressive and relatable. Don’t hold back from sharing your own financial failings (we all have some!) to show that money mistakes are okay to make; it’s how we recover and learn from them that really matters. If you want to talk to a loved one about debt, be prepared to offer actionable suggestions that can help them deal with their financial problem. Provide links to online resources, like your favorite personal finance blog or financial tech tool that helps users eliminate debt and establish good money habits. And tell them about the different types of debt payment plans. You may also want to advise that your family member or friend seek the professional help of a financial planner. If you’ve tried to talk to your loved ones about debt in the past and they haven’t listened to your advice or aren’t willing to engage in conversation, consider leading by good example. For example, pay for items in cash and keep all your receipts – and if your family member or friend asks, explain that this makes it easier to track your spending which in turn helps you live within your means. Be open and willing to discuss how you solve your own financial problems. Explain how you had to prioritize your spending and differentiate between needs and wants. Talk about the importance of valuing relationships and experiences over consumer goods. When friends or family ask how you handle your money, explain how you budget and allocate a percentage of your income to savings and retirement funds. If you can’t answer a specific question, offer to do some research to find the answer together. Alternatively, you can take subtle action that may encourage your indebted loved one to reconsider their own financial habits. The next time they ask you out for dinner, suggest hosting a home-cooked meal in instead (and if there are enough people attending, make it a potluck to further reduce individual costs). If they’re set on making every occasion a lavish gift-giving affair, ask if the family as a whole can tone down Christmas and birthdays or focus on charitable giving rather than buying lots of material things. Remember, not everyone will want to engage in an open dialogue about their financial problems – and you shouldn’t push the issue if they’ve made this clear. Continue to lead by positive example and know that your loved ones do notice. Actions speak louder than words, after all. Last Edited: 8th May 2014 The content of biblemoneymatters.com is for general information purposes only and does not constitute professional advice. Visitors to biblemoneymatters.com should not act upon the content or information without first seeking appropriate professional advice. In accordance with the latest FTC guidelines, we declare that we have a financial relationship with every company mentioned on this site. Kali Hawlk is a writer for ReadyForZero who enjoys discussing topics like student loans, budgeting, and paying off debt from the perspective of a millennial. You can read more of her work at the ReadyForZero Blog. 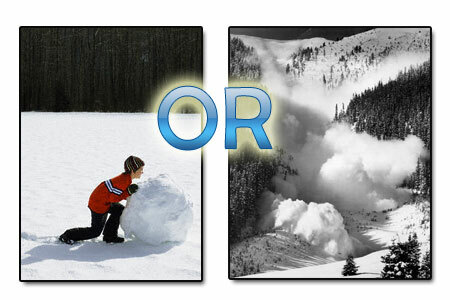 Tricky subject, but sometimes it is one that we have to be willing to approach. If you know that someone you love is struggling under debt and you can see the negative affects of it you should speak up. You don’t have to push it beyond that but if you sit in silence you cannot be frustrated by their decisions. You also need to speak up if there debt is having negative consequences for their relationships. Kali, great points on family and money. I was especially impacted by your thoughts on modeling good spending habits. My siblings and I have been working to take some expenses off of our retired parents plate, do you have any advise on this topic. Research I have done advises start as early as possible and make sure the lines of communication are open. The most important goal for us, outside of dignity in retirement for Mom and Dad, is to keep our relationships whole.